Not only do I love gift giving, but I love wrapping! No matter the gift, big or small, expensive or inexpensive, wrapping it is half the fun. 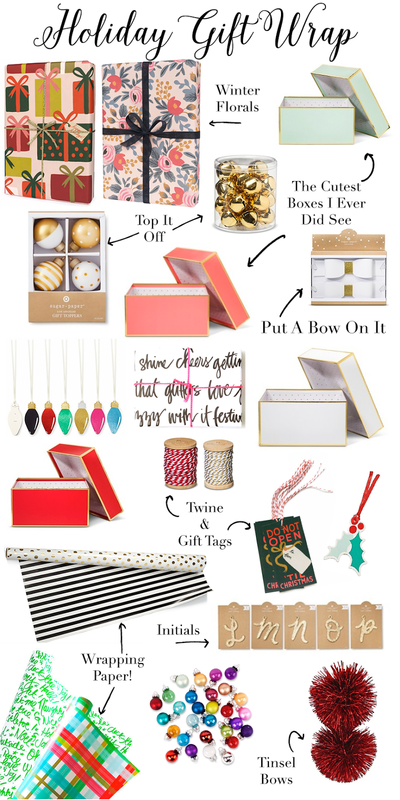 Boxes, bows, ribbon, paper, stencils, stamps, oh my! The list is endless. My mom taught me how to wrap at a very young age (probably because my love for Christmas was so strong). I'm pretty sure I have even wrapped some of my presents over the years (they were hidden in a box of course). I have rounded up some gift wrap that I love! Adding a fun bow and cute gift tag paired with a box that can be re-used it just as good as the gift inside. What kind of gift wrap do you use? Do you have a particular theme?